Ah, Kozui. 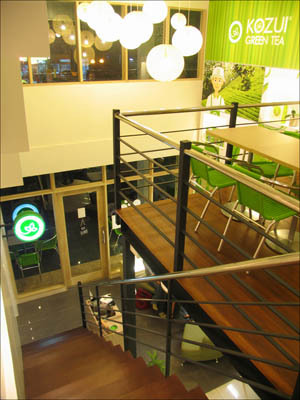 When I first heard of this green tea café, I was initially unfazed by all the raves it has been getting from foodies who stumbled upon the pretty little Japanese place along Tomas Morato. 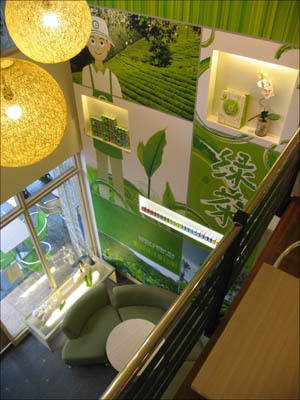 How exciting could green tea be?, I thought. While I am more of a tea drinker than coffee, I like my tea black with a little sugar and milk, and hardly ever green. If you share my sentiments on green tea, or if you’re not a fan of any kind of tea, I can almost guarantee that Kozui will make you think twice, or change your mind completely, about this age-old beverage. Like any commercial java joint, Kozui has an extensive tea menu (in hot or cold variations) that can rival the likes of Starbucks and Seattle’s Best Coffee any day. 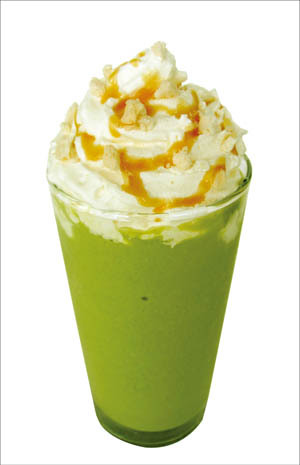 There are cold tea drinks infused with lemon called lemon teaz, cool POM teaz that got its name from adding pomenagrade syrup, fruit teaz with natural fruit syrup, tea lattes that can be ordered hot or cold, and ice blended korichio drinks (Japanese version of fraps) made with matcha powder, milk, and topped with whipped cream. Young entrepreneur and Kozui owner Anthony So explains that he first came up with the idea during a brief stint in Shanghai where he was exposed to all sorts of traditional teahouses. 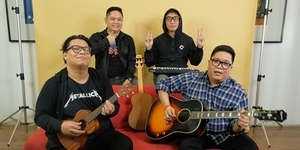 He wanted to bring something like it home, possibly to combat the proliferating coffee culture in the local scene, but with a healthier, younger and more hip concept in mind. The lemon teaz line is a refreshing collection of freshly brewed loose-leaf green tea served cold with thin slices of lemon. The Genmaicha Lemon Teaz (P70), a cooling tea drink made with gemaicha tea leaves, enjoys a unique, tasty roasted flavor that promises to be addicting. Anthony recommends it as one of the bestsellers. To my complete and unexpected satisfaction, the taste is sublime--not too sweet and with a delightful nuttiness to it from roasted rice kernels and popped corn. 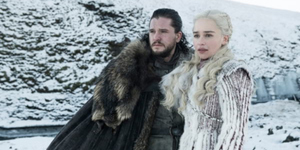 It easily became my favorite. On my next visit (shamelessly returning the following day), I tried the Moji Mint Tea Fruit Teaz (P85), a cool green tea mix with lime and mint leaves swirling in the cup. 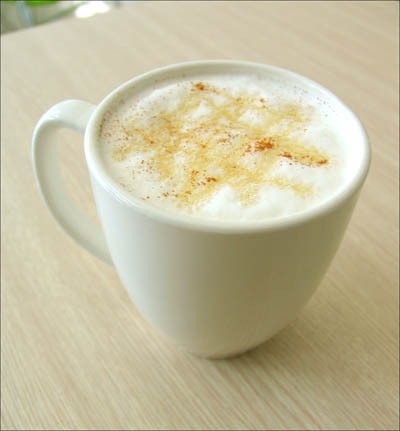 The creamy korichio drinks, which I have yet to try, come in house blend and fruit blend varieties. 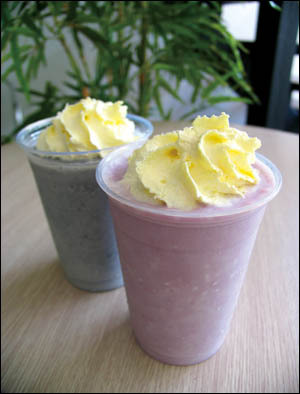 The house blend includes the only non-tea-based drinks in the house, flaunting Asian flavors like taro and black sesame. I hear the tea lattes are a big hit too, reinventing the milk-based coffee drink with roasted green tea and matcha flavors. 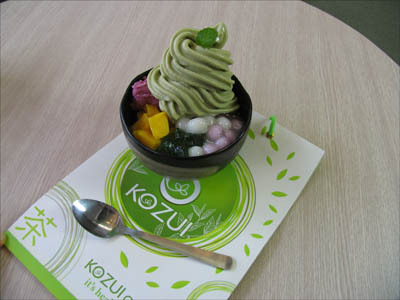 Still, there is more to Kozui than just a tea craze. Food offerings prove just as exciting through a selection of traditional and modern Asian dishes to whet the appetite. Finding its way to the menu is Tokyo’s famous Takoyaki delicacy (P98), a serving of pan-grilled tako balls stuffed with chunks of ika, ebi and negi (squid, shrimp and Asian leek, respectively) and topped with a squirt of yummy Japanese mayonnaise. Fine strips of nori wrapper are sprinkled on top, as are paper-like bonito flakes that appear to dance with air. Otherwise known as samurai balls, traditional takoyaki is supposed to include octopus morsels but Anthony opted to substitute it with squid, which is not as tough but still chewy. 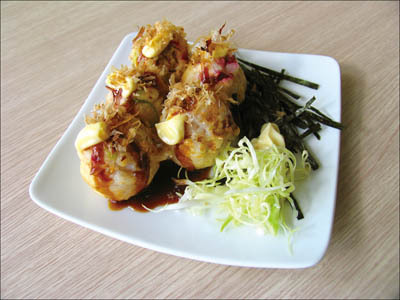 Special takoyaki sauce drizzled on it provides a sweet escape and the end result is a savory, filling treat. 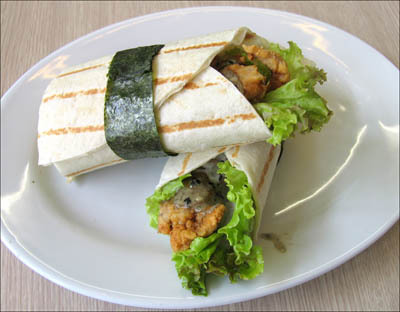 I fell in love with the Karaage Chicken Vegetable Wrap (P148), a halved serving of grilled pita bread with Japanese breaded chicken, lettuce, tomatoes, onions, and a dollop of black sesame dressing for the kill. The combination is stellar; a must-try on the menu. In keeping with the theme, cold noodles at Kozui include the Chilled Green Tea Zaru Soba (P148), and a Chinese-inspired Dandan Noodles (148), a spicy egg noodle dish with cilantro that gets its zing from pepper, sezchuan sauce and siling labuyo. I figure the genius behind this particular dish is how it’s simple but inventive; the understated flavors only make it more interesting. Just when I thought Japanese desserts were boring, Kozui introduced me to Anmitsu (P138). I was delighted to discover that a Japanese version of our prized halo-halo exists; the anmitsu combines shaved ice, ice cream, taro jam, green tea jelly, fruits, sweet azuki beans, and my favorite element in the group, oh-so-chewy mochi balls (think bilo-bilo in ginataan, only silkier). At Kozui, the anmitsu comes with several fruit flavors like strawberry, mango, and melon. I personally liked the mango with green tea ice cream. At first, I thought the mango would fall out of the place in the mix but surprisingly, it provided a welcoming, tangy zest that really boosts the flavor. 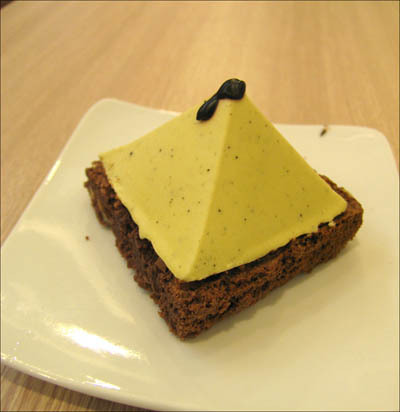 Of course, there are other desserts that I must come back for, such as the Mount Fuji Green Choco (P105), a pyramid-shaped brownie with creamy green tea on top and a burst of chocolate at its peak. 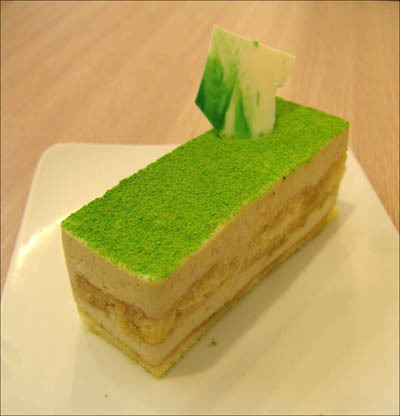 Also intriguing is the Green Tea-ramizu (P95), a Kozui spin on the traditional Italian dessert. After my first visit to Kozui, not only did I find myself harboring a newfound respect for green tea, I literally could not wait to go back. So I did, the very next day.